BD SafetyGlide™ shielding hypodermic needle can help reduce needlestick injuries and associated costs with it's patented BD Activation-Assist™ technology for fast and easy needletip shielding. Safety-engineered needles for BD SafetyGlide® syringes. 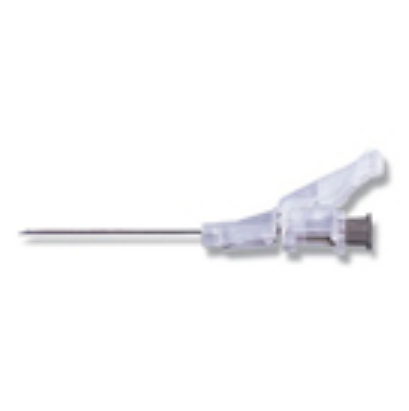 BD Activation-Assist™ mechanism allows fast and easy needletip shielding to help minimize needlestick injuries. All needles have a regular wall type and regular bevel. Sterile. I actually bought these needles because I used a similar needle in my nurse's office when I learned to inject in my quad. I find that the mechanism for self-covering actually makes a fantastic base to stabilize the needle when it's in my leg. My local pharmacies don't sell it, and I missed this feature. After a few months of using a regular needle, I tracked these down and I'm glad I did - they improved my experience tremendously. The order was completed very fast and received the package quickly! Really happy with the service! The Safetyglide needles are good to use and deliver painless injections. These needles are very easy to hold and also it is so easy to deliver the injection with the help of the support it provides.